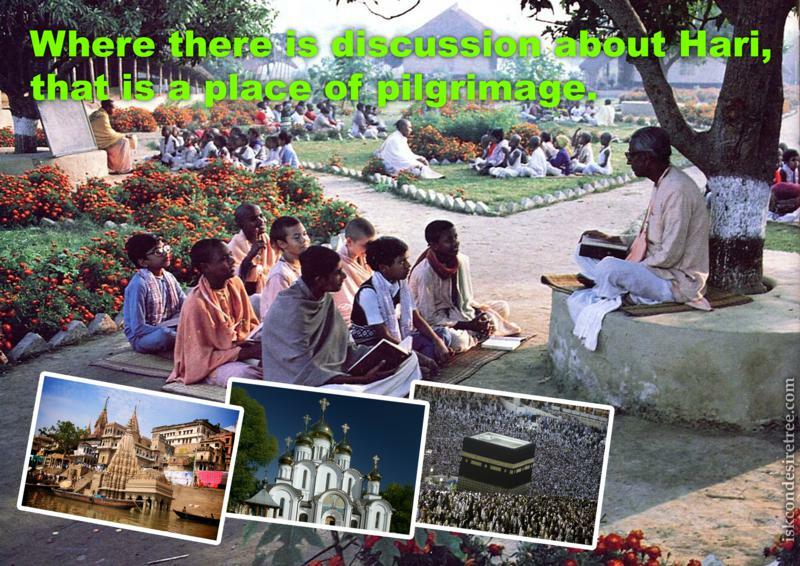 Where there is discussion about Hari, that is a place of pilgrimage. Every spot on earth where discourses on God are held is a place of pilgrimage. The ability to purify one's sin varies from one holy place to other. Bhakti Vinod Thakur explained that Navadvipa dham of all holy place is increasing its strength day by day in this age of Kali-yuga. The Lord Nityananda, Lord Caitanya and Balarama visited all the holy places and acted as a filter. In this way the holy places got relieved of the accumulated sins. Similarly the Great devotees when they visit the holy place they can purify the holy place by their potency of preaching and carrying Krishna in their heart, by their potency of their connection to Krishna they can neutralise karma.